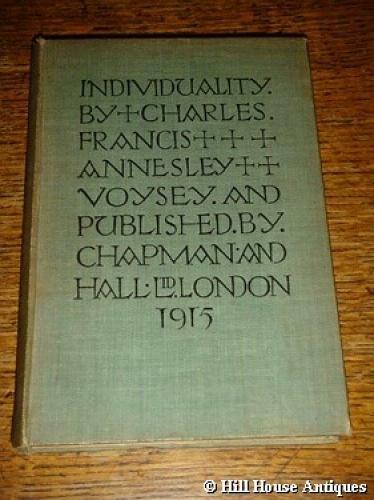 A scarce and out of print copy of the book written by CFA Voysey, Individuality, a 1st Edition, published by Chapman & Hall in 1915. CFA Voysey was one of the generation of late 19th and early 20thC European and American architects who passionately married design to morality, looking to nature as an analogy to architecture. He often spoke of the need to honestly express materials, structure and needs. In publishing Individuality, a complete representation of his ideas were contained in this volume.